Our Inn at Bay Harbor Getaway. Our magical romantic getaway experience. 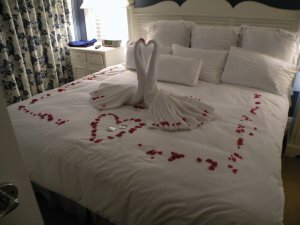 I knew the Inn at Bay Harbor was going to be spectacular, but I had no idea of how romantic they could make your stay. 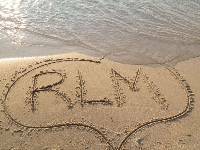 Sue and I needed a getaway. This place provided the "wow" we were looking for. Driving into Petoskey Michigan on 131 is quite an experience in itself. When you crest the hill coming into town your're greeted with a panoramic view of Little Traverse Bay. It really is breathtaking. As we pulled into the entrance to Bay Harbor we started getting the feel (excitement) of how special this was going to be. While driving to the inn we couldn't get over the majestic beauty and how stately the inn appeared. We had 680 sq. feet with living room, fireplace, full kitchen, huge bedroom and a bath and a half. Sliding doors from the bedroom and living room to our balcony had incredible views of Little Traverse Bay. Sue said she was never leaving. We were just getting unpacked when there was a knock at the door. They had brought us a tray of lucious strawberries with three different dips. We enjoyed them on our balcony while talking about how this whole experience was already beyond our expectations. As we were preparing to head out to dinner there was a knock on the door. They asked if we would like a turn down. I said we didn't need a turndown but the housekeeper said this was a "special turndown". Sue wanted it done so I gave into her (as I always do). We told her we were leaving for dinner and would be back later. Wow! Upon returning from dinner I opened the door to find the curtains drawn, soft music playing and Champagne on ice. Glasses and the ice bucket were surrounded by rose petals. 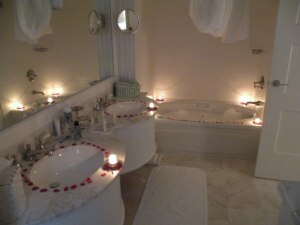 The bathroom had rose petals and tea lights around the sink and jaccuzi tub. A hot bubble bath had been drawn for us. It really was the "ultimate" for our romantic getaway. The Inn at Bay Harbor really knows how to do a very romantic turndown! As we sipped our Champagne on the balcony, overlooking the bay at sunset, we were in awe of the beauty. The ability to relax and truly leave all our cares at home. This was the exact time and the exact place for the break we needed. While all this was wonderful, it was my wife that made it special. Seeing her face and her reaction brought joy to my heart. It had been awhile since we had been up-north and we certainly picked the right place to enjoy each other. 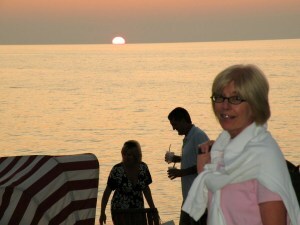 The Inn at Bay Harbor goes out of their way to provide world class service. This was one of the most romantic experiences we have ever enjoyed and we highly recommend it to you. 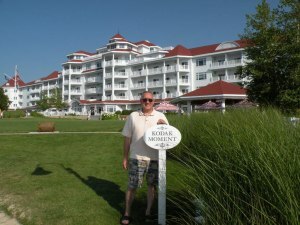 If you are thinking about a romantic getaway, wedding or honeymoon destination in Petoskey Michigan, definitely check out the Inn at Bay Harbor. Perfection!